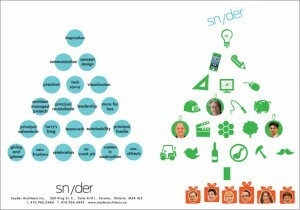 The Snyder Architects Holiday Card | Snyder | transformative design. controlled outcome. Yep. We’re designers in our souls. 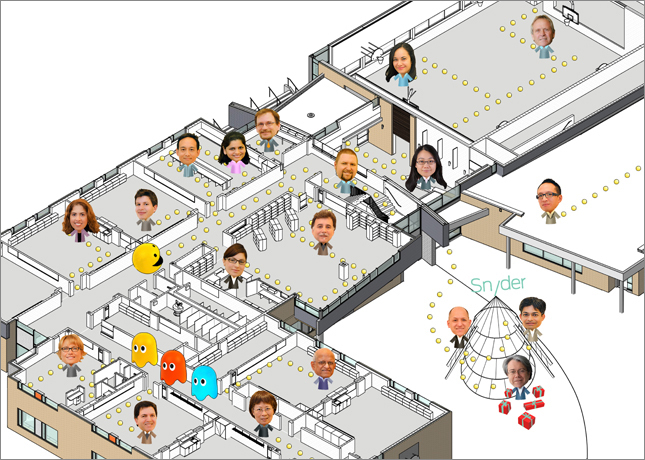 What began as a festive art project has snowballed over the years into a highly anticipated holiday collectible and studio tradition: the Snyder Architects holiday card. A few years ago, the torch was passed on to a very talented designer and ‘artist in residence’, Susan Tang. “The Christmas card is about the spirit of the holidays,” says Susan. 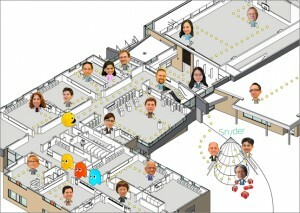 “It celebrates what we do as architects and showcases our team, with a twist of humour”. Check out SA cards from holiday’s past. This Year: After a few game themed cards, Susan decided it was time to get back to graphics. In keeping with the theme of architecture, we settled on a holiday puzzle to greet the winter season with some Snyder humour. The card features a tree with graphic symbols representing architectural concepts and studio events in 2013 (answers on the back). The tree starts with inspiration on the top; illustrates our process and approach; and the bottom tells the story of our social initiatives this year (Habitat for Humanity Women Build, Charity Golf Tournament, Movember and new SA Social Media Channels). 2012: Susan was looking for a design that tied architecture in with popular culture; at the same time, she wanted to showcase our work. The inspiration came from the computer animated comedy, Wreck it Ralph; featuring retro video game characters in 3D. Susan had a vision of Pac-Man roaming one of our schools. She had a blast placing team members and Pac-Man within St. Conrad Catholic Elementary School; the school opened in September 2012 and was nominated for a PUG Award. Also, SA was officially introducing two new Principals to the leadership team; so Doug, Avi and Anil can be seen trimming the tree together in the courtyard. 2011: We dared to be playful! 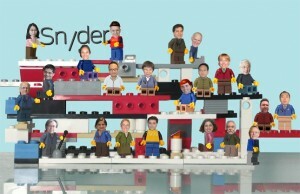 Susan was inspired by a cherished childhood Christmas gift– Lego. Avinash was super excited about the idea and built the Lego structure appearing in the card. The Lego people were from Anil’s collection (his “son’s collection”). Doug was the captain with everyone aboard the Snyder ship. 2010: The theme was fun with architecture in the holiday season. 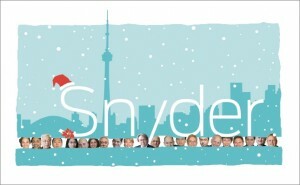 Susan created a Snyder blue skyline to represent architecture in Toronto. It was also a chance to put studio faces to the firm name. Season’s Greetings from the team at Snyder Architects!